Pond Algae Control Is Possible! New! 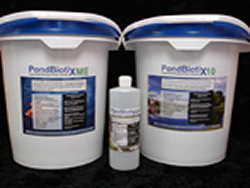 Our PondBiotix line of beneficial bacteria products take natural treatments to an unmatched level! With highly concentrated formulations (up to 10x) you can now lower nutrients and reduce unwanted muck and sludge in any size of pond. Safe for fish, wildlife, pets, and people, PondBiotix products are eco-friendly while they retain their potent aquatic cleaning power. The Biosphere Pro 1/4 Acre, 1/2 Acre and 1 Acre Treatment is great for larger waters from 1/4 Acre on up. Eliminate unwanted growth the right way with beneficial bacteria and enzymes for true, long term cleansing. Using our proprietary Advanced Microbe Delivery System you treat the pond only once every 30 days and let the time release application continuously work to clean the pond. Easy, safe, simple, and effective! The Submersible Dispenser and Small Pond Biosphere Pro are great for small ponds, water gardens and stock tanks. Treats from several gallons up to 10,000 gallon applications with multiple dispensers. Balance and clear your pond the right way with beneficial bacteria and enzymes for true, long term cleansing. Treat the pond only once every 30 days and let the time release application continuously work to cleanse the pond. Ultrasonic Pond Algae Control is a great new technology for eliminating blooms in water features and ponds of all sizes! This product produces sound waves that are safe for marine life but deadly for most strains of algae. It's particularly cost effective at treating larger ponds with green water problems. Use with bacterial enzymes and adequate aeration for a full pond balancing and algae control program without the use of chemical algaecides. Algae-Off Granular Algaecide is an ultimate pond cleaning tool! It's particularly useful for waterfall areas and can kill algae on contact. Algae-Off works through oxidation which provides immediate control of algae. Dead matter floats to surface where it is removed by skimmer or net. Ideal for use with bacteria. Use bacterial enzymes for long term cleaning while utilizing Algae-Off for spot control on algae. Aeration is one of the most important and vital additions for many ponds. A number of important elements are helped by adequate dissolved oxygen in the water. Fish health can be maintained even in the heat of summer and good bacteria can be stimulated and circulated to a greater degree. Aeration can also be good for winter time use to keep water open from ice build up. Or Call to Order 800-575-3189 - All Day-Every Day! Hello and welcome to our website! We offer a very focused line of products that are safe and natural options to improve clarity and health in all sizes of ponds, lakes, and water gardens. This results in better methods of pond algae control. We base our main treatment philosophy around our proprietary line of beneficial microbes* and when needed combine this with submerged pond aeration and ultrasonic algae controls. Along with these primary treatments we have accessories that can help in a variety of conditions, such as pond dyes for excessive sun exposure, highly targeted weed control and unique tools for manual algae removal and pond cleaning. Regardless of what product you may choose you can be assured that they all combine pond-tested effectiveness and are eco-friendly and safe. And we back each one up with an honest willingness to help by answering your questions and together we can solve your green water or string algae problems! So take a look around. Be sure to read our primary article on algae control in ponds and visit our blog to learn more about your pond and feel free to contact us if you have any questions! *It is against federal regulations to use the term "algaecide" and relate it to anything other than a product which is EPA registered as such, and designed to specifically kill algae. Beneficial bacteria, aeration, dyes, and barley straw for example, do not fall within this category. All of these products simply and safely help to improve various conditions in a pond that foster unwanted growth and thereby may create a cleaner pond in the process. No claims are made in any portion of this website that any of these products kill or control algae directly, which we in fact believe is of great benefit to your pond.